The press keeps rolling! New Brain Damaged listener Tony of Cheshire, U.K. learned about the podcast while reading the 30. April 2007 issue of The Independent. 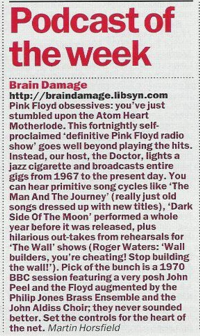 Tony was kind to send a scan of the mention. Thanks Tony! The Independent is a British “compact newspaper” published by Independent News & Media. Launched in 1986, it is one of the youngest UK national daily newspapers, with a circulation of 253,737. Whoever made the mention at The Independent, I thank you. After posting The Daily Aztec article, fellow Brain Damaged listener Mike S, posted a comment saying he was in London between the 3rd and 16th of September ’06 and first learned about Brain Damage from a small mention he saw in the The Times! The Times is a national newspaper published daily in the U.K. since 1785 and its been regarded as Britain’s “newspaper of record” and is preserved in the British Library’s newspaper library in that capacity. It’s a very big deal. Mike was kind enough to send a scan of the clipping he saved. Very cool! Thank you Mike and thanks to the unknown individuals at The Times who made the mention. 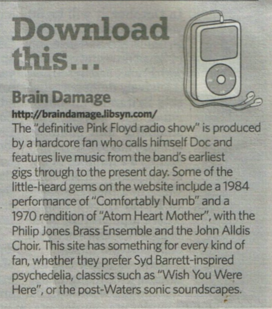 Its an honor to be in Pink Floyd’s hometown newspaper! 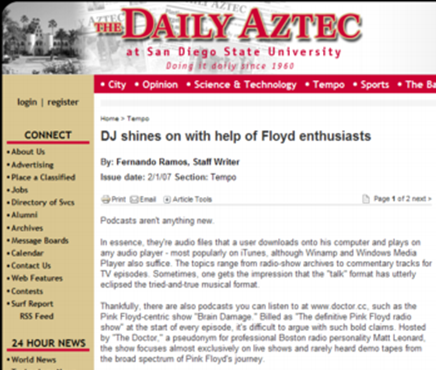 Fellow Brain Damage listener Fernando Ramos, a television, film and new media production senior at San Diego State University happens to be a columnist for the entertainment section of San Diego State University’s newspaper, The Daily Aztec. A few weeks ago Fernando asked if he could interview me for and upcoming article and here it is. He wrote up a very nice one indeed. Thank you Fernando! In essence, they’re audio files that a user downloads onto his computer and plays on any audio player – most popularly on iTunes, although Winamp and Windows Media Player also suffice. The topics range from radio-show archives to commentary tracks for TV episodes. Sometimes, one gets the impression that the “talk” format has utterly eclipsed the tried-and-true musical format. 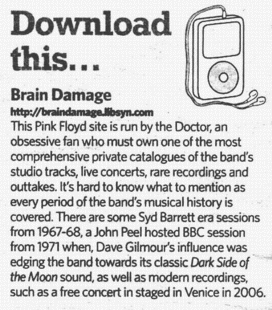 Thankfully, there are also podcasts you can listen to at floydpodcast.com, such as the Pink Floyd-centric show “Brain Damage.” Billed as “The definitive Pink Floyd radio show” at the start of every episode, it’s difficult to argue with such bold claims. Hosted by “The Doctor,” a pseudonym for professional Boston radio personality Matt Leonard, the show focuses almost exclusively on live shows and rarely heard demo tapes from the broad spectrum of Pink Floyd’s journey. As the mastermind behind the album “The Dark Side of the Moon” – famous for its 741 week reign on the Billboard Top 200 chart and carrier of the song from which the podcast takes its title – Pink Floyd requires little introduction. A fascinating mixture of furious guitar work, biting social commentary and bold experimentation in both its aural design and highly stylized visual live shows that have resisted the test of time, the band has rightfully earned its place standing tall among the giants of rock. As such, a show such as “Brain Damage” is nothing short of a gold mine. The Doctor elaborated on the origins of the show. This was able to take shape when The Doctor was given a lucky break. Unfortunately, the show was canceled a short while later, but after much shopping on The Doctor’s part to other universities and Internet radio stations that weren’t interested, he still wasn’t ready to close his practice. “I thought to myself, ‘Screw it, I’ll podcast the show,'” The Doctor said. Despite his initial worries of losing his audience from the transition, he built his own studio from the ground-up. What followed was a boon for the Pink Floyd enthusiast and classic rock fans alike. On a regular (usually biweekly) basis, The Doctor injects each podcast with about a two-hour dose of Floydian goodness. Each episode has a unifying theme ranging from the complete live performances to more esoteric “Floyd’s Worst Moments” – a collection of various technical blunders and, most amusingly, singer Roger Waters’ infamous temper tantrums. It’s these latter shows that make the podcast so much fun for both the listeners and the host. The Doctor says he’s proud of quite a few shows, but Podcast No. 67, “One of Your Turns,” is his personal favorite. One fact that may surprise some listeners, given the continuing controversy over MP3 distribution, is the Recording Industry Association of America is mostly hands-off with the show. That doesn’t seem to be anytime soon. Shows are still being updated, and The Doctor isn’t secretive about the fun he has recording it.